The system comprehensively includes every multiple of 1, 2, 5 and 10, spanning five orders of magnitude. Why do such a thing? Because it’s dead simple to count by 1s, 2s, 5s, and 10s, and you can get to any sum by combining just a handful of pieces. This is the heart of decimal currency, and the foundation of how children are taught to perform fundamental arithmetic. The Americans aren’t quite there yet, because they still have quarter dollars – a fraction which breaks the convention. I’ve shopped around on the internet, and of course, a set of kitchen measures following such a convention does not exist. It seems the industry has only moved half way to metric, and every single product is just a sloppy conversion of imperial measures. Without the availability of a properly thought-out set of kitchen measures, the rest of this article is essentially hypothetical. Alternately, it’s easy to obtain a beaker with 100ml, 200ml and 500ml markings these days. However, a 10ml spoon appears to be non-existent. If you find yourself specifying things in tablespoons, quarts, cups, ounces or furlongs, you’re doing it wrong. Liquids should be in ml, solids (by volume) should be in cc (which is conveniently the same as ml, but doesn’t imply liquid), and all weights should be in grams. Temperatures should always be in Celsius, and always correctly labelled. 180°C is a good temperature for an oven. 180° is the arc of a semicircle. Don’t confuse the two. If the main ingredient were flour, an ideal amount would be 200cc. This is because it’s a single measure from a single utensil in the (above) set. If that’s not possible, aim for two measures of a single utensil (e.g. 400cc is 2 x 200cc measures). Each measure loses time and accuracy, so avoid measures like 80cc, which will require four 20cc measures). You should absolutely avoid specifying quantities that require measures from multiple utensils. Adding 85ml of oil to a cake would be terrible, because you’d need either have to take 17 measures from a 5ml measure, or take 4 x 20ml measures plus an additional 5ml (getting two utensils dirty). The absolute worst thing you could do is blindly convert from imperial to 6 significant places. specifying 14.7868ml of honey is just ridiculous. Anything that’s a liquid or powder/granular should be measured by volume. While most people have kitchen scales, they are terribly cumbersome and not as accurate. It’s far easier (and more accurate) to measure a 500cc scoop of flour than it is to measure 250g on the scales. In contrast, don’t measure things like apples and beef in cubic centimetres. It’s impossible to measure those things in that way. The lesser the weight, the less practical it is to measure Only drug dealers keep jeweller’s scales in their kitchen, so don’t specify one solitary gram of salt in a recipe. If you really have to, you can include volume and weight with the weight in brackets (e.g. 500cc (256g) flour). If doing so, ensure that the volume is a nice round value, as it’s scales are inherently better suited to unconventional measures. 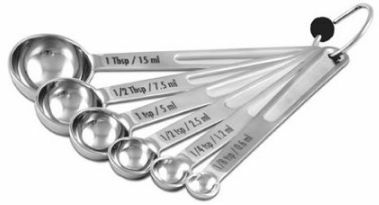 Even in a modern kitchen with modern utensils and the latest cookbook, you’ll find imperial measurement strewn all the way through it. I’m living in a society that has been metric for the better half of a century, and things like this are still prevalent. The only way to fully remove any trace from imperial measurements is to start from scratch and not carry anything forward. To properly convert would require throwing away your measuring utensils and burning your recipe books, so I don’t have high hopes this happening any time soon.